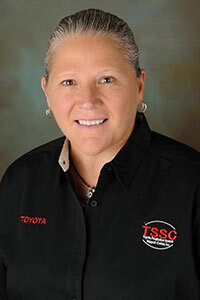 Richardson began her career with Toyota in 1993 as a stamping team member at Toyota Motor Manufacturing Kentucky, Inc. (TMMK), and was soon promoted to team leader. In 1995, she was awarded a leadership development rotation in TSSC where she was responsible for supplier shop floor improvement initiatives focusing on quality, productivity, customer satisfaction, people development and cost savings. Two years later, Richardson transferred back to TMMK’s stamping shop as group leader. In this role, she was responsible for team member training, continuous improvement activities and leading short and long-term strategic TPS planning. From 2005-10, Richardson worked at Toyota’s North American Production Support Center (NAPSC) as a regional trainer. NAPSC is a state-of-the-art training facility designed to promote Toyota global best skills training practices throughout its North American manufacturing facilities. Richardson returned to TSSC in 2010 to help lead process improvement activities with manufacturers, hospitals, schools and non-profit agencies seeking to learn TPS. In 2013, she was promoted to manager; working closely with Toyota’s manufacturing facilities responsible for leading process improvement activities in Toyota plants and suppliers seeking to improve their own levels of performance. Prior to joining Toyota, Lisa spent nine years working for a large architecture firm in Lexington, Kentucky; responsible for marketing and business development. She obtained a Bachelor of Arts in Public Relations from Eastern Kentucky University (1984). Richardson is a boat owner who enjoys spending time on the lake.